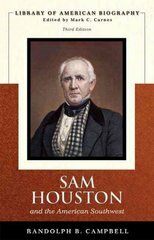 Sam Houston and the American Southwest (Library of American Biography Series) 3 Edition In this biography, Randolph B. Campbell explores the life of Sam Houston and his important role in the development of the Southwest. Governor of two states, president of an independent republic, and for thirteen years a United States senator, Sam Houston forged a life of great adventure, frequent controversy, and lasting achievement. Within the historical context of the emerging West, Houston’s story is not only one of courage and fortitude, but also aids in understanding of the possibilities and limitations of leadership in a Democratic society. The titles in the Library of American Biography Series make ideal supplements for American History Survey courses or other courses in American history where figures in history are explored. Paperback, brief, and inexpensive, each interpretive biography in this series focuses on a figure whose actions and ideas significantly influenced the course of American history and national life. In addition, each biography relates the life of its subject to the broader themes and developments of the times.